Below is a selection of recommended accommodations. Prices are subject to change, please call or visit their website for current rates. There are lots of Air BnB options in our area. For a more extensive list of local hotels and bed and breakfasts please visit the Northampton Chamber of Commerce website. The guest suite at Zea Mays Printmaking. 2 private bedrooms, full kitchen, sitting room and1-1/2 baths. On site housing. When it is not in use for residencies, we offer it to workshop participants and visiting artists. Here’s a link to photographs and description of it. The cost is $85 per night ($75 for ZMP members). Contact shel@zeamaysprintmaking.com for availability. 50% deposit required. A friend of Zea Mays offers this suite with private kitchen and bath on the second floor of her home, just a 15-minute walk away. Reserve here through airbnb. 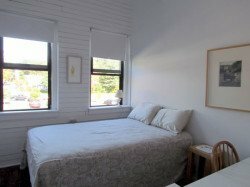 Studio member, Polly offers a room in her house through air bnb. Her place is walking distance from the studio. Airbnb has many great listings in our area – check them out here. Sugar Maple Trailside Inn 62 Chestnut Street Florence, MA 01062 413.585.8559. About a one mile walk to the studio. Located right on the local bike path. Flower Hill Farm Retreat P.O. Box 454 Williamsburg, MA 01096 413.268.7481. Rustic farmhouse divided into private apartments. Ten minute drive to the studio. Lovely BnB in Holyoke Jay’s Bed & Breakfast: www.jaysbedandbreakfast.com.